Planning your trip in advance saves both your time and nerves, which is a huge benefit for every traveler. Upon arrival to Václav Havel Airport Prague, you have several options for getting to Prague. The airport is located 17 km away from Prague center, so getting to the city can become a true challenge. We’ll review in details 4 most popular ways of how to get from Prague airport to Old Town. In the result you will be able to choose transport from Prague airport that suits best to you and your budget. How to find: bus stops at the exits from D, E, F of Terminal 1 and exits C, D and E of Terminal 2. In every tourist destination without exceptions public transport is the cheapest way to get from an airport to a hotel. Unfortunately, in Prague buses do not go directly to the Old Town, they take you to the metro lines. At the airport bus stop you can see buses 119 and 100. If you head to the western part of Prague, choose bus no. 100. It goes to the yellow metro line B Zličín. In case you need the Green metro line A take bus no.119. This is a more frequent bus. The entire trip usually takes about 50 minutes, not taking into account traffic jams that may take another 20-30 minutes during rush hours. You can buy bus tickets in the terminals halls or from ticket machines at the bus stop. In case you don’t find them or forget to buy tickets in advance, no panic, bus drivers sell tickets too but the cost will be higher – around 1.55 eur. A good alternative to buses is airport express. The plus of this transport is its destination in the city center - Praha Hlavni Nadrazi (Prague Main Station) – so you don’t need to transfer to the metro halfway. But keep in mind that its cost is twice higher. And again, a ticket can be purchase in the terminals, ticket machines or from a driver. The drawback of airport express is limited working hours from 5.30 am to 9 pm. And be ready to wait up to 30 minutes for your bus. The second cheapest transport from Prague airport to Old Town is Uber. Being quite a young service, it’s already managed to prove its reliability and has become even more loved and frequently used in comparison with a regular taxi. The Uber cost is a bit lower than taxi’s but the price is not fixed so be careful of elevated pricing rates during peak hours. Usually Uber drivers wait nearby the airport building but sometimes it becomes harsh experience finding your car somewhere in the parking lot among hundreds of others. Also, drivers usually don’t speak English and their service quality varies so think it over well in advance, otherwise you won’t even be able to explain where to go. Another difficulty you may face is booking an Uber taxi from Prague airport as it requires Internet connection that is not always available at spot. 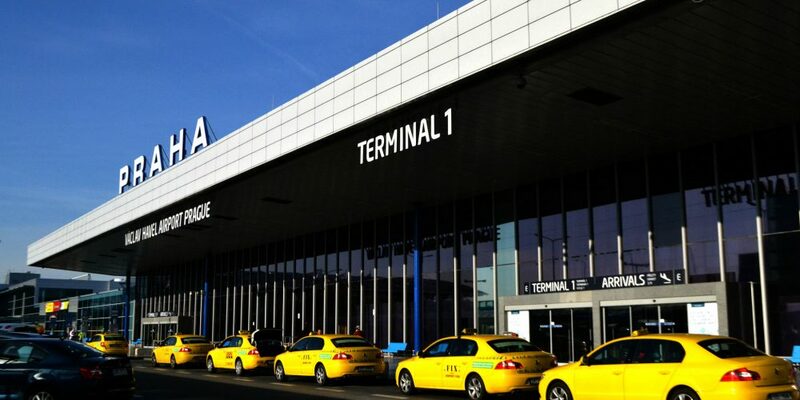 People coming to Václav Havel Airport choose a taxi service to avoid transfers and to get directly to the hotel or other individual destination. Prague taxis are easily recognizable thanks to white color with logos and roof signs. The bad news is taxi from Prague airport does not have fixed pricing for airport transfers. Usually they charge about 25 eur, though late at night or on holidays it can exceed 35 eur. Prague airport taxis work upon the principle first-come-first-served so during the peak time you may stuck up in the line waiting for your turn. Taking into account the price and a list of inconveniences, experienced travelers who know how to get from Prague airport to Old Town recommend choosing private transfers. The most comfortable and quick option for any traveler is private transfers from Prague airport with such services as T&A Transfers. Whether you are a businessman or you have arrived with your family for a holiday, you will doubtlessly estimate the comfort of a private transfer from Prague airport. The list of benefits you get with T&A Transfers is impressive. The comparison of private transfers from Prague airport with a public transport leaves the latter far behind. When you rent a car from Prague airport you won’t go to the city center like everyone else but to your individual destination wherever it is. Also, you don’t waste time searching for a bus stop and waiting for your route. Not to mention the absence of transfer to metro and walking up and down the stairs with heavy luggage. A large advantage of transfers from Prague airport in comparison with a taxi or Uber is time saving. You don’t drag your luggage around the airport looking for an exit, Uber car or a taxi because your personal chauffeur is waiting right at the terminal exit with the welcome sign. Unlike in a regular taxi service, the competence and professionalism of your T&A Transfers chauffeur is at the highest level so your trip will be quick, safe and maximally comfortable. It’s obviously up to you only to decide how to get from Prague airport to Old Town and we hope that this information has helped you to make a choice and get to Prague fast and with comfort. Have a great time in the fabulous city of Prague!